India’s minister of petroleum and natural gas, Dharmendra Pradhan, reportedly informed the Society of Indian Automobile Manufacturers (Siam) convention on September 6th of a planned rollout of Compressed Natural Gas (CNG) filling stations to reach 10,000 units. Although improvement of air quality will result from an increased transition to this cleaner fuel, the primary motivator is to reduce dependence on oil imports. In 2017, India imported 213.93 million tonnes of crude oil at a cost of $70.2 billion (source: Forbes) and was the world’s fourth largest importer of oil (source: WTEx) after United States, China and Japan. The greater adoption of CNG for road transportation has the potential to save more than $27 billion. The minister said that the industry has invested heavily to extend city gas distribution networks, which will help in expansion of the refueling network to 10,000 station from the existing 1,424 (source: Petroleum Planning & Analysis Cell, India) stations throughout the country. 82% of all CNG stations are located in Delhi, Mumbai and Gujarat. Work is underway for expansion of CGD network in 300 districts, nearly half of India’s geography. This massive infrastructure expansion will unleash great potential for automobile sector to manufacture CNG-LNG vehicles. According to drivespark.com, the current CNG price in Delhi is INR 40.61 per kg ($0.56), petrol is INR 81.28 per litre ($1.13) and diesel is INR 73.30 per litre ($1.02) Nationwide, CNG is cheaper by as much as 41-62% and the total cost of ownership shows CNG to be about 20% cheaper than diesel and petrol. The incremental cost to purchase a CNG-powered vehicle is recoverable in about 12 months depending of type of use and distance travelled. Bhargava says a CNG car costs only about 40,000 rupees ($560) more than one that runs on gasoline. CNG car sales would go up if the fuel distribution network is beefed up, he said. With half the Indian automobile market now driving its vehicles, auto manufacturer Maruti Suzuki is well positioned to extend its already significant investment in natural gas technology. 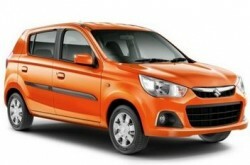 It currently has seven models in production: Ertiga, Dzire, Eeco, Alto, Celerio, Wagon R and Carry. “The government has already put the use of CNG for transportation at higher priority than its use for power generation…we would like to use CNG for cars as far as possible,” Bhargava said. According to Nikkei Asian Review, Maruti Suzuki produced 74,000 CNG vehicles in 2017. There are now about 3.1 million natural gas vehicles in India.